Normally I rarely redo a same team in Football Manager except some of my real life favorite teams, but now it's time for a comeback for me. Back in the time I enjoyed the save on FM13 with Los Béticos so much, that Nestor Subiat will be joining Real Betis Balompié for FM18. My first thoughts were to build up a strong team that is based on spanish/portuguese speaking players and will be one of the bigger teams in Europe on a long term. Although I am not sure if I will be able to go far enough to achieve this, as due to personal reasons it will most likely be that I only will be playing for around two month after the final game is out. When talking about Sevilla in the football world nowadays we clearly think mostly about FC Sevilla, the team which won two Spanish cups and four Europe League (previously the UEFA Cup). But what a lot of people don't know is that Real Betis Balompié was the first Andalusian football club joining La Liga in 1932 and the first Andalusian team to compete in the UEFA Champions League. Betis' city rivals Sevilla FC were the first club in Sevilla, founded in October 1905, while a second club, Sevilla Balompié were established in September 1907. Balompié was founded by students from the local Polytechnic Academy and were in operation for two years before being officially recognized (in 1909).In 1914, the club merged with Real Betis FC, who had emerged as a spin-off from Sevilla FC. The name Betis is a remnant of the Roman era. The River Guadalquivir, flowing through the city of Seville, was formerly called "Betis". Apart from the Real Betis Balompié football club, this old name is also honored by a street, Calle Betis, in Seville. Calle Betis is located right on the Guadalquivir and is one of the liveliest streets in Sevilla. Hint: Balompié translates literally as football, as opposed to the most commonly adopted anglicized version fútbol. 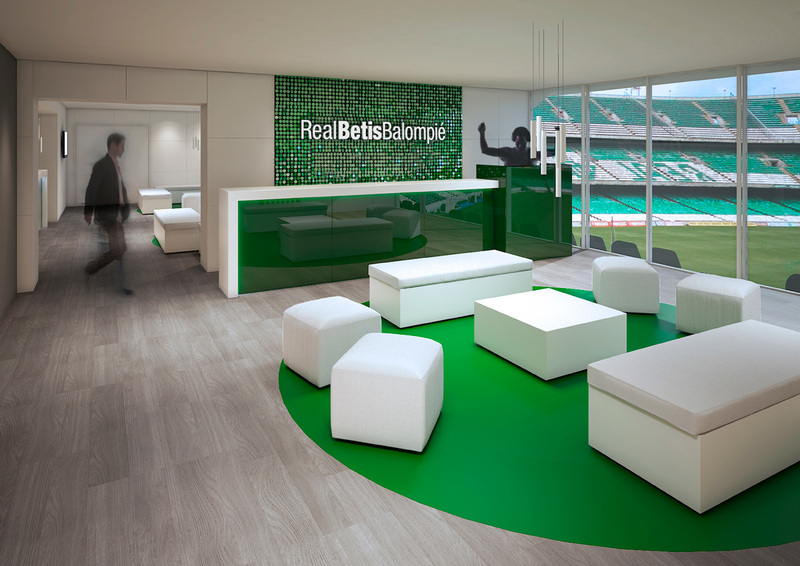 During the Spanish Second Republic (1931–1939), royal patronage of all organizations was nullified, and thus the club was known as Betis Balompié until after the Spanish Civil War when it would revert to the full name. Betis marked their 25th anniversary year by winning their first Segunda División title in 1932, finishing two points ahead of Oviedo FC thus becoming the first club from Andalusia to play in La Liga. Under the guidance of Irish coach Patrick O'Connell only three year after their first game in the Spanish top division, Betis won the La Liga in 1935, currently their only top division title. Currently Betis Sevilla is one of nine clubs that managed to win La Liga. The following years weren't as good as the ones before, just 12 years after the title celebration they found themselves relegated to the Tercera División (third tier) in 1947. Many fans see the ten years they spent in that category as key to the "identity" and "soul" of the club. During this time, Betis earned a reputation for filling its stadium and having a massive support at away matches, known as the "Green March". When the side returned to the second level in 1954, it gained the distinction of being the only club in Spain to have won all three major divisions' titles (Primera, Segunda and Tercera División). In 1955, Manuel Ruiz Rodríguez stepped down from running the club believing he could not offer further economic growth, he was replaced by Betis' most famous former president, Benito Villamarín. During his reign Betis returned to the top division in 1958–59 and finished in third place in 1964. His purchase of the Estadio Heliópolis in 1961 is seen as a key point in the history of the club – the grounds were called the Estadio Benito Villamarín. In 1965, Villamarín stepped down from his position after ten years at the helm of the club. Just one year after Villamarín's departure, the club would again be relegated to division two, then rising and falling almost consecutively until consolidating their place in the top level in 1974–75. After that triumph, Betis competed in the European Cup Winners' Cup: after knocking out Milan 3–2 on aggregate in the first round, the side reached the quarter-finals, where they lost to Dynamo Moscow. Despite a strong performance in Europe, the team suffered league relegation. RCD Espanyol, Hércules CF and Betis Sevilla all finished the league with 30 Points after 34 games. Betis saw themself on the 16th place (and being relegated) despite having a better goal difference than the other two teams, but having a bad record in the games against Espanyol and Hércules. In 1992, Betis found itself subject to new league rules and regulations due to is restructuring as an autonomous sporting group (SAD), requiring the club to come up with 1,200 million pesetas, roughly double that of all the first and second division teams, despite being in level two at the time. In just three months, the fans raised 400 million pesetas with then vice-president Manuel Ruiz de Lopera stepping in to provide an economic guarantee while himself becoming majority shareholder as the team narrowly avoided relegation. In 1997, 20 years after winning the trophy for the first time, the club returned to the final of the Copa del Rey losing 2–3 against Barcelona after extra time. Incidentally, Barça was the club Manager Serra Ferrer would leave Betis for that summer, to be replaced by former player Luis Aragonés. Aragonés would only last one season with the club, leading the side to the eighth position and to the quarter-finals in the Cup Winners' Cup, where they would lose 2–5 on aggregate to eventual winners Chelsea. Ramos was gone after just one season, however, being replaced by former Cup Winners' Cup-winning manager Víctor Fernández. He led the team to eighth and ninth in the league and the third round of the 2002–03 UEFA Cup, being knocked out by Auxerre (1–2 on aggregate), during his two-year reign. For 2004, Fernández was replaced by the returning Serra Ferrer, who guided the team to the fourth position in the top flight. They also returned to the Vicente Calderón on 11 June 2005 for the Copa del Rey final, lifting the trophy for only the second time after an extra-time winner by youth graduate Dani in a 2–1 win against Osasuna. In 2007 Betis celebrated their centenary year. The festivities included a special match against Milan, the reigning European Champions. Surrounding the celebration, it was a time of great change in terms of the playing and technical teams. During the latter campaign, the club was the 37th-best followed team in Europe regarding average attendances. After many years of staving off relegation, Betis' 2008–09 season culminated with a 1–1 draw against Real Valladolid at home. With this outcome, the club finished 18th in the table and consequently was relegated to the second division. Again did they have the same amount of points as Getafe that stayed up, only having a worse goal difference of one point. On 15 June 2009, over 65,000 Béticos, including icons such as Rafael Gordillo, Del Sol, Hipólito Rincón and Julio Cardeñosa joined the protest march in Sevilla with the slogan 15-J Yo Voy Betis to let the majority owner Ruiz de Lopera know that it was time to put his 54% share of the club on the market for someone, some entity or the Betis supporters to buy those shares and remove Lopera from the day-to-day operations of the club. Despite the protests, no upper management changes were made during the season, which would ultimately see Betis fail to gain promotion back to the top level. Again under Pepe Mel, Betis started 2011–12 with four wins in as many games, with Rubén Castro retaining his goal scoring form from the previous season, where he scored 27 goals. Betis finished 13th in their first season since returning to La Liga. In the 2012–13 season, Betis finished seventh in La Liga and qualified for the 2013–14 UEFA Europa League, the first European qualification for the club since the 2005–06 Champions League. This European campaign ended in the quarter-finals after losing on penalties to local rivals Sevilla. Betis were relegated from La Liga with three games still to play in the 2013–14 season, but returned immediately as champions with two games to spare. In its initial years, Sevilla Balompié dressed in blue shirts with white shorts, which represented the infantry at the time. From late 1911, the team had adopted the shirts of Celtic, at that time vertical stripes of green and white that were brought over from Glasgow by Manuel Asensio Ramos, who had studied in Scotland as a child. When the team became Real Betis Balompié in 1914, various kits were used. By the end of the 1920s, Betis was once again sporting green and white stripes, around this time the Assembly of Ronda (1918) saw the Andalusian region formally adopt these colors, not being known how much the two are linked. Since then, this remained Betis' shirt, despite several versions (including wider stripes). With a 56,500-seat capacity, the Estadio Benito Villamarín is the home ground of Real Betis. Between 1979 and 1982, the capacity of the stadium was increased up to 50,253 for the 1982 FIFA World Cup when it hosted 2 group matches. Despite much planning, the stadium's renovation plans were constantly postponed, and half of it remained unchanged. On 27 October 2010, it returned to its first denomination after a decision by the club's associates. In July 2016, the southern stand of the stadium was demolished for expansion. After re-modelization, the total capacity of the stadium will increase from 52,000 to 60,720 seats. The expansion work was completed in August 2017 in time for the 2017-18 La Liga Season. Not only additional seats were added in the latest renovation, but also the look of the Stadium was redesigned. Nothing much to say about won titles in the past, exactly two have been won by Los Béticos in the past: One La Liga title in 1932 and one Copa del Rey title in 1977.